Hats Off: Born on this date in 1895, when it was also Friday, Constantine Falkland Cary Smythe. 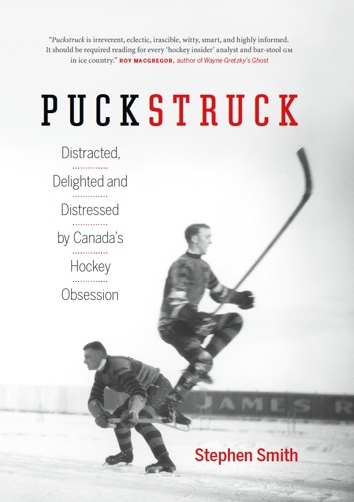 “Young Constantine hated the name from the time he was old enough understand it,” Kelly McParland writes in his 2011 biography, The Lives of Conn Smythe, and soon he made a change. 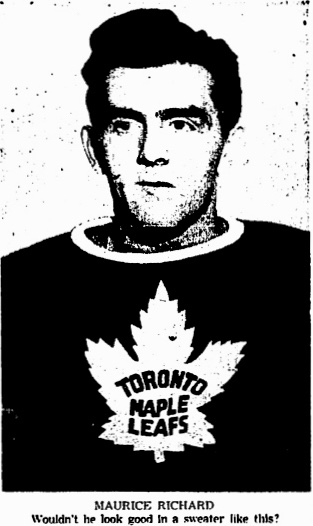 Connhe borrowed from an ancient Irish king, “hero of a hundred battles.” In 1927 Smythe headed the syndicated that bought the Toronto St. Patricks and re-invented them as the Maple Leafs. 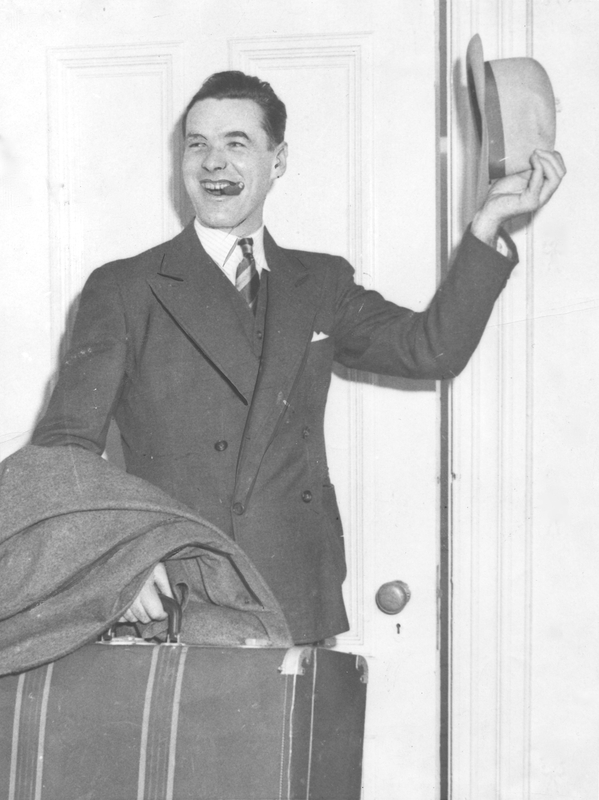 Here he’s seen at the age of 54 on the night of Saturday, April 16, 1949. 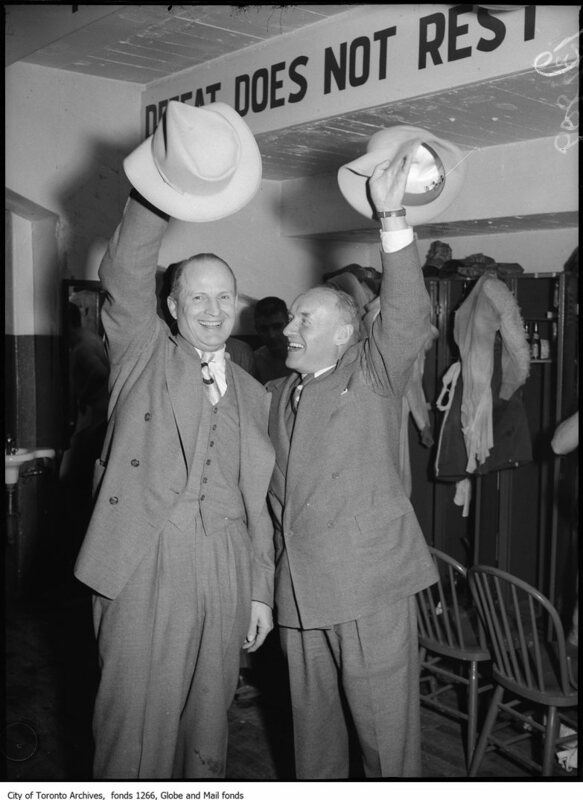 That’s Leafs’ coach Hap Day with him, of course; the dressing-room salute follows their team having swept to a third successive Stanley Cup championship, the sixth of Smythe’s tenure to that point. 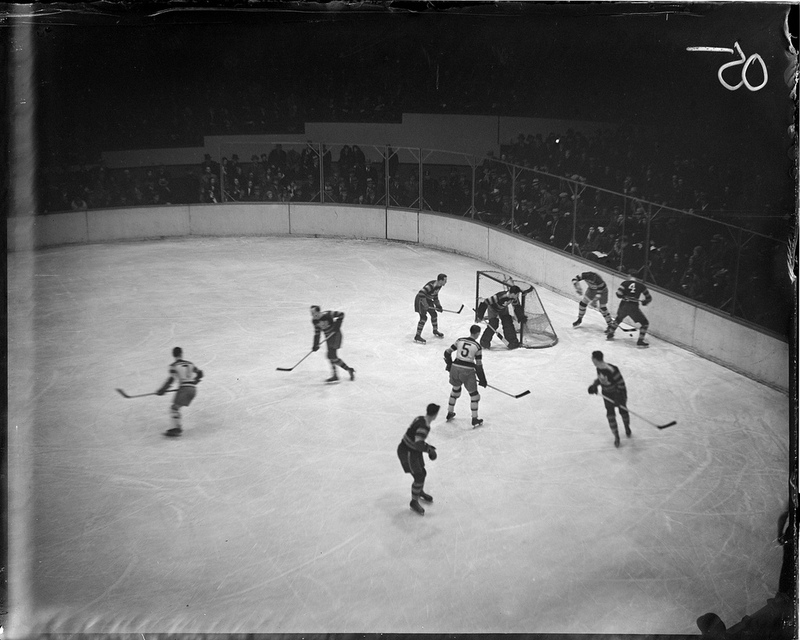 Toronto defeated the Detroit Red Wings 3-1 at Maple Leaf Gardens on the night to take the Cup in four games. charlie conacher: many happy returns of … tomorrow? Charlie Conacher was just 28 when he announced his retirement from hockey in January of 1938. 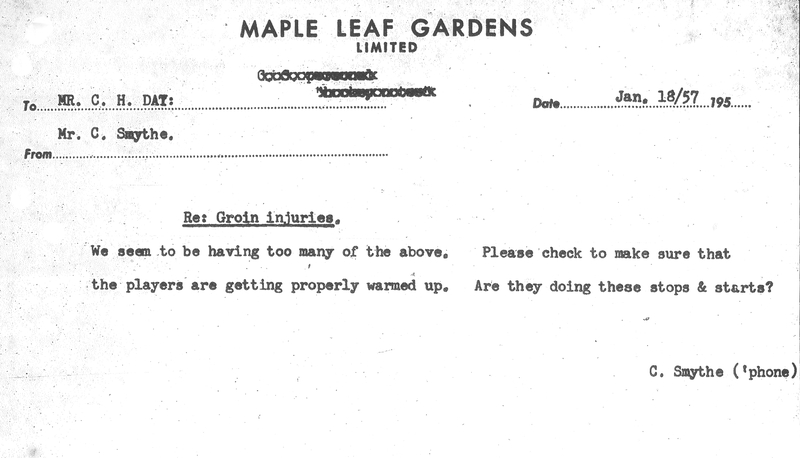 Most in the media agreed with The Ottawa Journal’s assessment: the Leaf captain was “the game’s hardest shooter” and had been, for years, “one of its most compelling figures.” Injuries to knees and kidneys, wrists and back had worn him down: it was on the advice of Leafs’ physician Dr. J.W. Rush that he was making his exit. 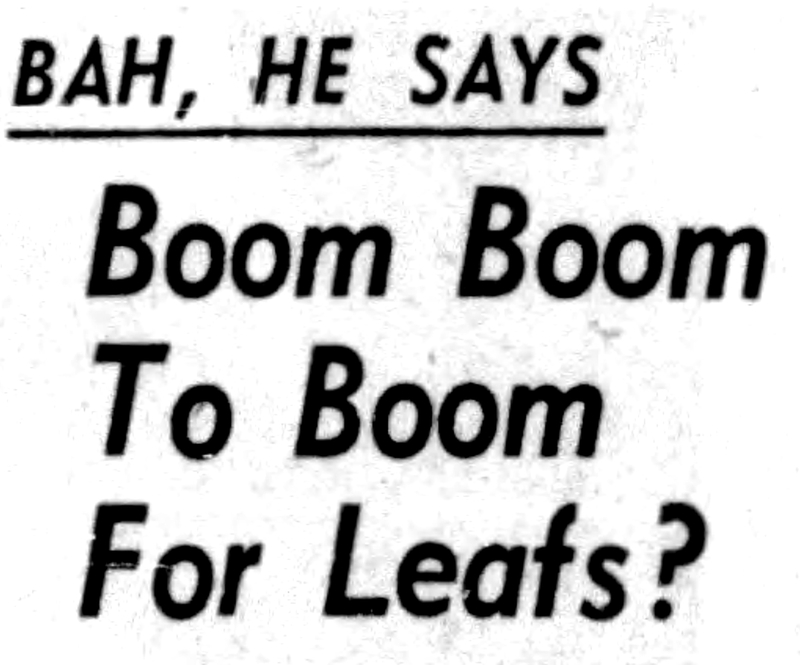 By columnist Walter Gilhooly’s account, the news hit the NHL like a bomb, and would severely impair Toronto’s chances for a Stanley Cup. Leafs’ manager Conn Smythe wasn’t about to argue that: “It’s a terrific blow to us,” he said. 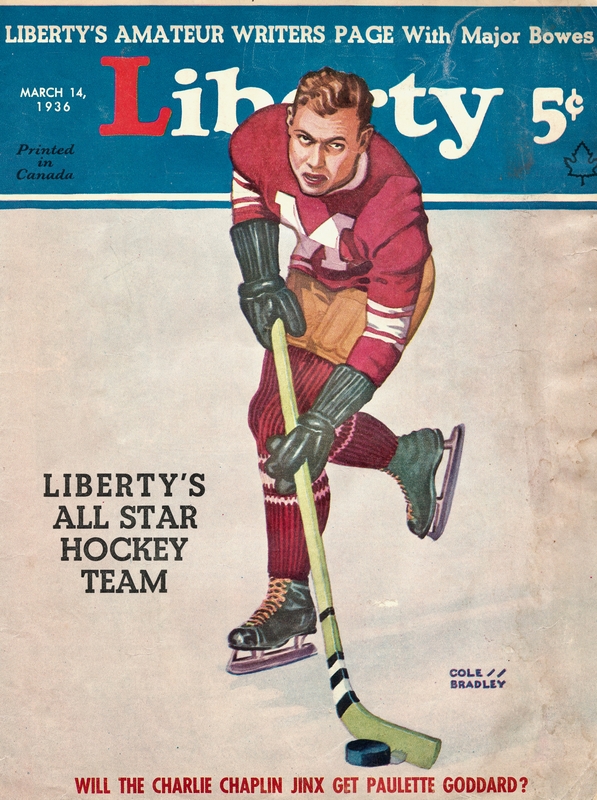 Conacher’s retirement didn’t last: he made his return to the rink the following season as a Detroit Red Wing, where he played for a season before heading to New York, where he was an American for another two years before he (definitively) hung up his skates in 1941. 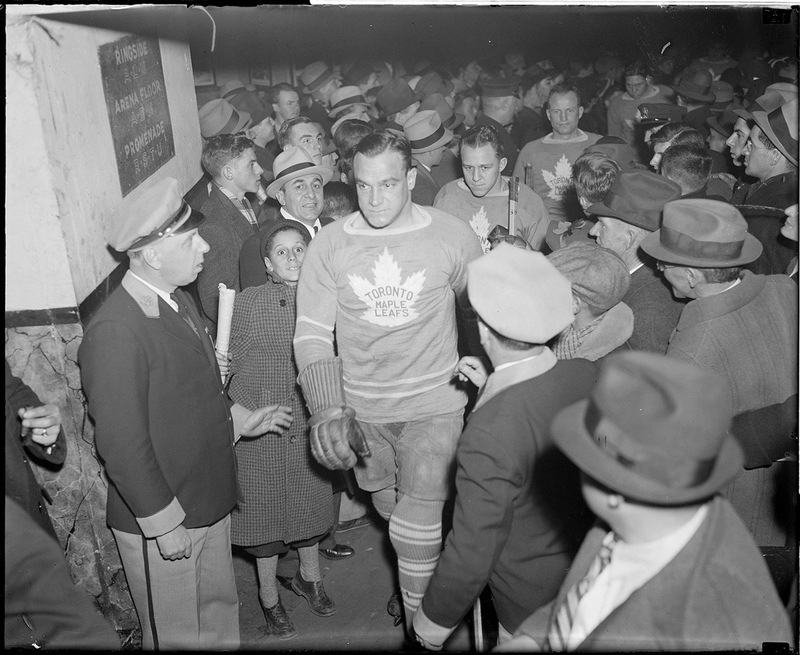 While Conacher’s initial 1938 retirement didn’t stick, it did allow for an extended period of career memorializing as teammates and coaches and sportswriters summed up and celebrated his years as (quote) a bruiser in action and one of the strongest men in hockey. Before Conacher made his NHL debut in 1929, Bill Cook of the New York Rangers was said to be the best right winger in hockey. Now, retired and coaching, Cook weighed in to name his all-time all-star team. George Hainsworth was the best goaltender he’d ever seen, Eddie Shore and Ching Johnson the best of defencemen. 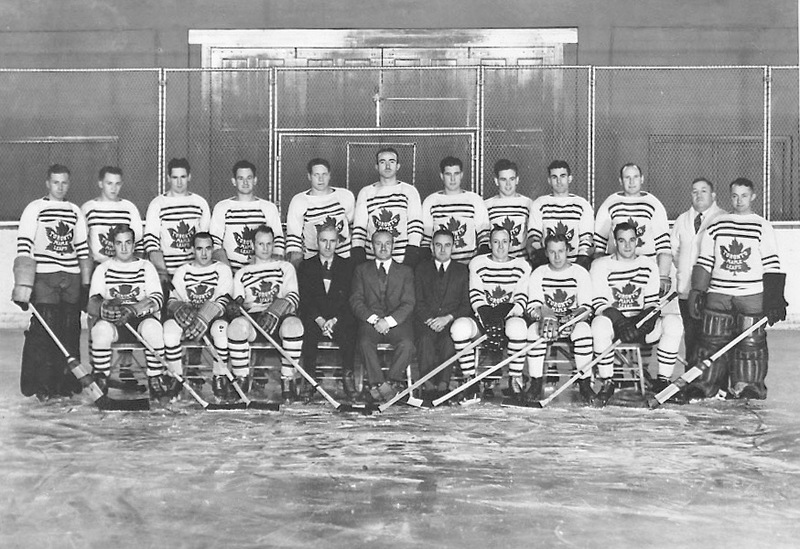 For forwards, he anointed Howie Morenz at centre, Aurèle Joliat and Conacher on the wings. Across nine NHL seasons, Conacher had scored an even 200 regular-season goals by then, another 14 in the playoffs. Five times he was the NHL’s leading goalscorer; twice he led the league in points. He wouldn’t add substantially to those numbers in his three subsequent non-Leaf years, but his totals are still impressive. In 459 NHL games, he collected 225 goals and 398 points. In 53 playoff games, he scored 23 goals and 43 points. He helped the Leafs win the 1932 Stanley Cup, and in 1961 he was elected to the Hockey Hall of Fame. Charlie Conacher died of throat cancer on December 30, 1967. He was 58. For all the facts and figures we can readily summon to delineate his life and times, the date of his date of his birth remains elusive. Is today the day we should be observing his arrival at Toronto’s Salvation Army Maternity Hospital in 1909, or should we be saving the greetings and salutations for tomorrow? 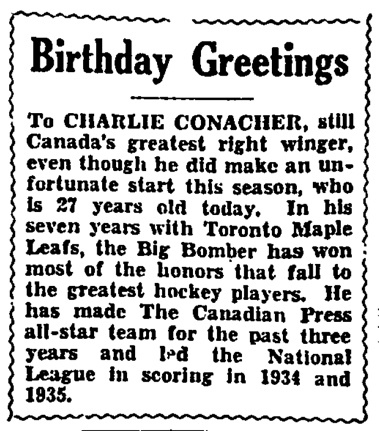 Many of the standard hockey references actually give Conacher’s birthdate as Monday, December 20, 1909. If you’re at the library and you haul down Total Hockey off the shelf (be careful), that’s what you’ll see listed in the NHL’s fat 1998 official encylopedia (and its 2000 second edition, too). Nowadays, the league keeps its records online, and that’s the date you’ll see too if you click over to Conacher’s file at NHL.com. The Hockey Hall of Fame’s Conacher page says the same, as does the researcher’s go-to resource, Hockey Reference. Also: Wikipedia. But not everyone agrees. Back at in the stacks, reach for The Complete Encylopedia of Ice Hockey, a venerable old tome compiled by Zander Hollander and Hal Bock in 1970, and you’ll find Conacher’s date of bath given as December 10, a Friday. Another voluminous online source, hockeydb.com, concurs. December 20, 10, 9: which is it, then? December 20 is the easiest to dispense with: I haven’t seen any evidence to back it up. SIHR’s December 9 seems the most promising, at least from a documentary perspective. The Conacher biography there cites as its source Conacher’s birth certificate, and that would seem to close the case, such as it is. But if you go out on your own to search for this, what you’ll find is … not quite that. Could she have made a mistake? It’s not for me to presume that she did, and I’m sorry if it seems rude to doubt a mother’s word. (It does; I see that.) 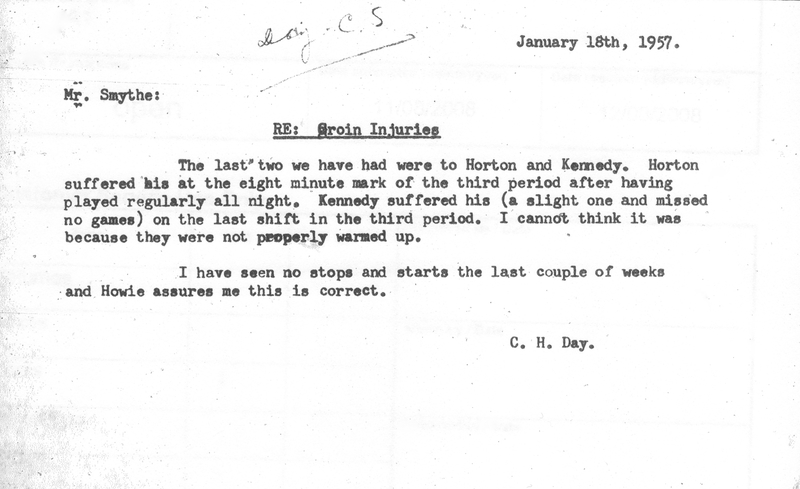 It’s just that, well, Conacher himself seems to have understood that his birthday fell on December 10. Is it possible, too, that the Globe erred again, 31 years later, in a short, sad note published on Monday, December 11, 1967, just a few weeks before his death? I guess so. 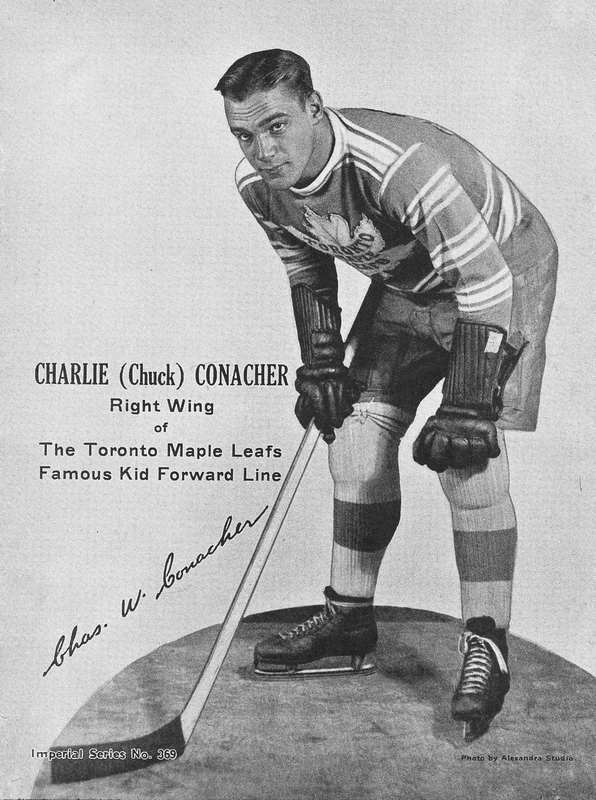 “Charlie Conacher, right wing member of the Toronto Maple Leafs’ Kid Line of the 1930s, celebrated his 57th birthday in the Toronto General Hospital yesterday,” that item began. The fact that it was his 58th birthday doesn’t exactly proclaim its credibility, I realize, but that on its own doesn’t discredit the birthdate reported. All in all, I’ll tend towards December 10 as Charlie Conacher’s birthday, I think. For those who prefer to celebrate it today, here’s to you, and him. It was Charlie Conacher’s birthday on Saturday and early in the day, Bill Tobin, president of the Black Hawks, wired Doug Bentley, team captain, that a win would be a nice birthday present for the club’s coach. Charlie was lucky to get away with a tie.